Next time you cut into an avocado to make guacamole or a California salad, don't be too quick to toss out the large seed in the middle of the fruit. Dry avocado seeds pack a big nutritional punch that may help you stay healthier and live longer. But you will need a high-powered food processor to grind the seeds into edible form. Avocado seeds are rich sources of an antioxidant called anthocyanins. Anthocyanins may protect against colorectal cancer, according to a study conducted at the University of Leicester in England. In the study, published in the February 2009 issue of “Cancer Prevention Research,” tumors in patients given doses of anthocyanins shrunk considerably. Anthocyanins, which may also reduce inflammation and aid digestion, can be found in other fruits and vegetables, including cranberries and red cabbage. Avocado seeds also provide vitamin C. Fifty percent of the vitamin C in avocados can be found in the seeds. The antioxidants in vitamin C, in addition to boosting your immunity, may also give your metabolism a boost. Several studies, including one conducted at the University of North Carolina, show a link between vitamin C intake and the ability of the body to burn fat. The study found that men and women who took vitamin C during exercise enjoyed higher rates of metabolism than those who took placebos, according to a report published in the April 2008 issue of “Applied Physiology Nutrition and Metabolism." Dry avocado seeds contain bioflavonoids similar to those found in green tea. Bioflavonoids may help protect against heart disease. In a study conducted by Japan’s Tohoku University Graduate School of Medicine, people whose diets contained plentiful amounts of bioflavonoids enjoyed longer, healthier lives. Of the 40,000 people whose health was monitored in the 11-year study, those who consumed bioflavonoids from green tea were 30 percent less likely to die from heart attacks and strokes, according to the “Journal of the American Medical Society,” published in September 2006. Dry avocado seeds are used in assorted folk remedies. If you suffer from diarrhea or dysentery, mixing some ground avocado seed into a cup of tea may provide relief. If you have a toothache, you could place a piece of seed in the affected area for temporary abatement of pain. 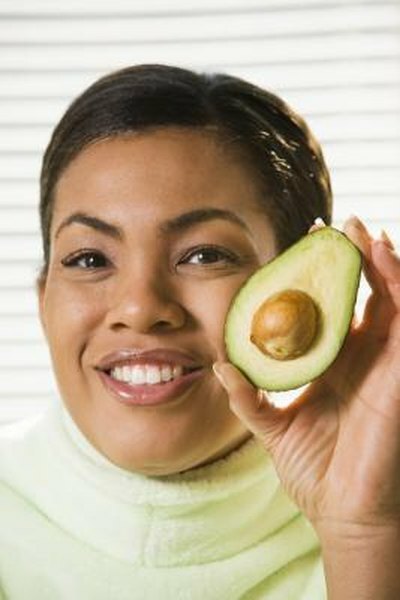 You can also use powdered avocado seeds externally to alleviate dandruff, and a paste of water and crushed seeds to treat pimples; in case of a makeup emergency, you can use the paste in place of cheek blush. Two factors may temper your enthusiasm for seeking out the nutritional benefits of dry avocado seeds. The first is that the hardness of the seeds makes them difficult to grind. You will need a food processor with a sharp blade to grind the seeds. The second problem is that the seed of the avocado contains tannin, and you may find it bitter. One way to disguise the taste is to use a teaspoon or so of powdered avocado seed in a smoothie in the same way that you might add a protein or vitamin boost to a blended drink.